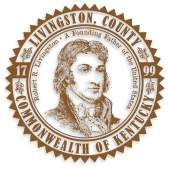 The County Treasurer administers the financial affairs of the Livingston County Fiscal Court and is responsible for fulfilling requirements set out by KRS 68.210, 68.020, 68.300, 68.360 and the Uniform System of Accounts for Kentucky Counties. The County Treasurer is responsible for budget compliance, reporting financial information, processing of all financial transactions, investment policy, and providing analytical data to the Fiscal Court with recommendations regarding financial decisions. The annual budget is managed by the County Treasurer with the direction from the Fiscal Court. This consists of accounts payable, receivable, grant fund allocation, employee payroll and human resource requirements. The County Treasurer is responsible for reporting to the Department of Local Government who oversees the financial obligations of county governments. You can request a copy of the Livingston County Budget and financial statements from the County Treasurer's Office.